Regional transit planners are looking to take advantage of growing ridership around Cincinnati’s second largest employment center by developing what will become the bus system’s secondary nexus. Officials from the Southwest Ohio Regional Transit Authority (SORTA) say that construction will begin on the Uptown Transit District, a collection of four new transit hubs throughout Uptown, in the coming months. The new hub is intended to serve Cincinnati’s uptown neighborhoods which create the region’s second largest employment center with more than 50,000 jobs. Many of these jobs are associated with the region’s largest medical institutions and the University of Cincinnati, and even though the area is served by a variety of Metro buses, it has been difficult for transit riders to find or coordinate transfers between buses. One of the four new transit hubs will be built along Jefferson Avenue at the University of Cincinnati. Rendering provided. Since the failure of the 2002 MetroMoves campaign, which included a plan to construct several regional bus hubs, the region’s largest transit provider has been able to utilize other funding sources to move forward with a more limited approach. The Glenway Crossing Transit Hub was the first of these to become reality when it opened in December 2011. 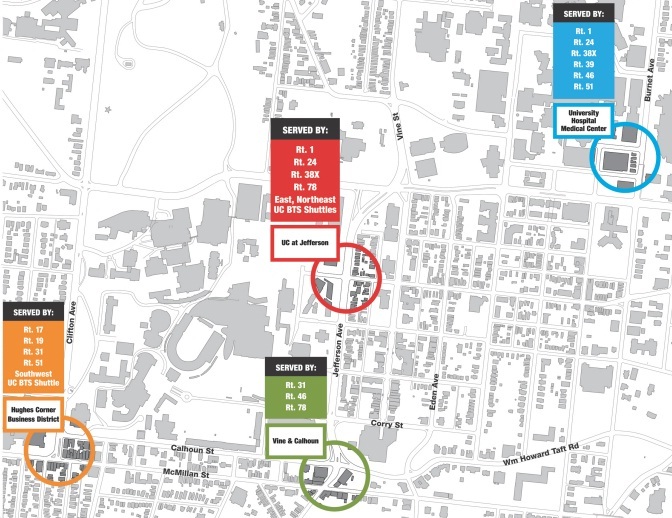 With ridership increasing 4.2% over the past year, due in part to an increase of use by students at the University of Cincinnati, the transit agency wants to move forward with the next component of the regional bus hubs originally envisioned as part of MetroMoves. The four separate hubs that will make up the Uptown Transit District, officials say, will include shelters and real-time arrival boards modeled after those installed at Government Square last June. Dunne says that the hub locations were designated after transit planners reviewed the combination of the existing route network, existing passenger travel patterns, geography and street pattern of the Uptown area, and dispersed land use and trip attractions. In an effort to focus attention on existing routes, Metro recently conducted several public sessions on modifying bus routes to increase utilization of the Uptown Transit District. In addition to existing service modifications to enhance usage of the Uptown Transit District, officials say that the four new hubs will benefit from the planned phase two expansion of the Cincinnati Streetcar and new Metro*Plus limited stop service that will begin operating between Downtown, Uptown and Kenwood. The $6.9 million project was funded through a mixture of funding, approximately 72% of which came from Federal sources, and will begin construction in April. Plans call for additional bus hubs, like the Glenway Crossing Transit Hub and Uptown Transit District, to be developed in other large employment centers around the city as money becomes available.